Success has followed James Naile at every stage of his professional baseball career, although if you ask him, he's just been in the right place at the right time. The A's 24th-ranked prospect already pitched at every level of the Oakland system over the past three seasons, winning back-to-back Texas League championships in 2016-17. As he settles into his first season starting at Triple-A Nashville, the results have been the same. 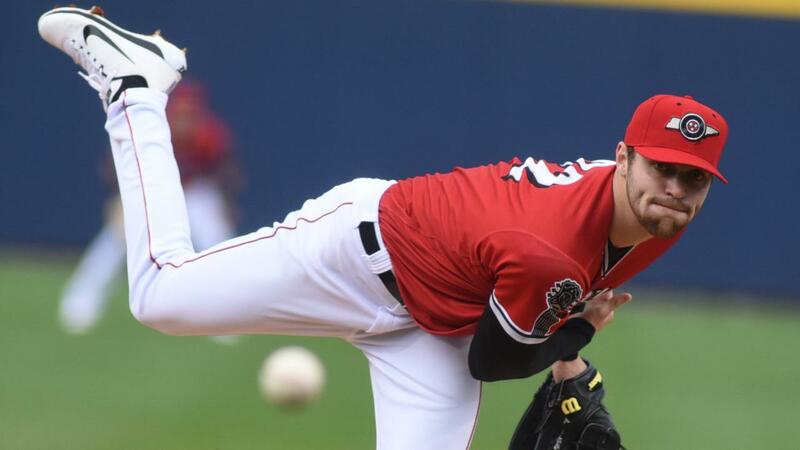 Naile tossed a five-hitter for his first career complete game on Sunday as the Sounds completed a sweep of their doubleheader with a 1-0 blanking of Omaha at First Tennessee Park. "I think it's a testament to the defense," said Naile (3-0), who extended his season-opening shutout streak to 17 2/3 innings. "They made some amazing plays behind me today and all season. I just go up there and try to throw strikes and attack hitters and get ground balls. The defense does their part and I just try to do mine." The 25-year-old right-hander issued one walk and struck out seven on Sunday. He set down 11 of the last 12 batters he faced and, thanks to some late help from his teammates, was able to go the distance for the first time since the A's selected him in the 20th round of the 2015 Draft. "Early on, I was feeling out the hitters and working in different pitches. And later on, we just stuck to our strengths and tried to get as many ground balls as we could. I really trust our catcher [Dustin Garneau], he does a great job back there," Naile said after recording eight of his 21 outs on the ground. "But I was done. I was at my pitch count and battling there at the end, so seven was going to be it for me." Nick Martini drew a leadoff walk in the bottom of the seventh and took third on a double by Slade Heathcott. Steve Lombardozzi Jr. was intentionally walked, but Garneau foiled the strategy by delivering a walk-off single to left field on a 1-0 pitch. "It was so exciting in the dugout. We had great energy," Naile said. "We were all fighting to get one across. Their pitchers did a really good job today, too. But it was great to see our hitters battle out and sneak a run across in the seventh when it mattered most." Heath Fillmyer held the Sounds to two hits and a walk while striking out four over 5 1/3 innings for Omaha. Richard Lovelady (0-1) recorded two outs but gave up a run on three hits and two walks. "You know, I've just been really fortunate. Just being at the right place at the right time," said Naile, who won a Minor League Gold Glove in 2016. "I moved around a lot in 2016 and last year to come back from that oblique injury and get another great opportunity was special. I've always been surrounded by great players and great individuals and I don't take any of it for granted. Being part of those two title runs with Midland is one of the best parts of my career so far. "My focus has always been to go out there and do my job and my job is to get outs. Right now, we're trying to take the next step, using all four pitches and learning how to sequence them. This is my first season with four quality pitches and I need to fine-tune some things and be more well-rounded. I don't want to just be a sinkerballer." Nashville also won the opener, 14-7, as B.J. Boyd drove in four runs out of the ninth spot in the lineup and Lombardozzi went 2-for-3 with three RBIs and two runs scored.